Are you excited that it's football season!? You'll love this adorable football card by Samantha! She used our Touchdown Tails Stamp Set to create a fun card that you can send someone for any occasion! 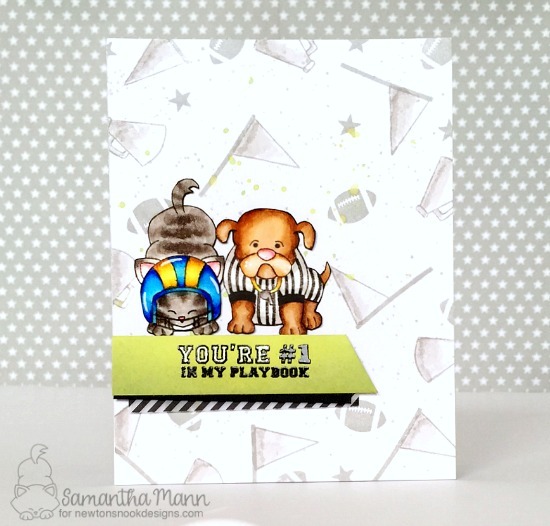 She colored the cute kitty in the football helmet and the dog dressed as referee and added them to this fun card with the "You're #1 in my Playbook" sentiment! She even created a fun background using the football, flag and megaphone images too! This set is so cute and you can customize it to represent your favorite team by changing the colors! What a cute card! Love the background you created!! That's a cute and fun card !! Newton with the helmet makes me so laugh ! !